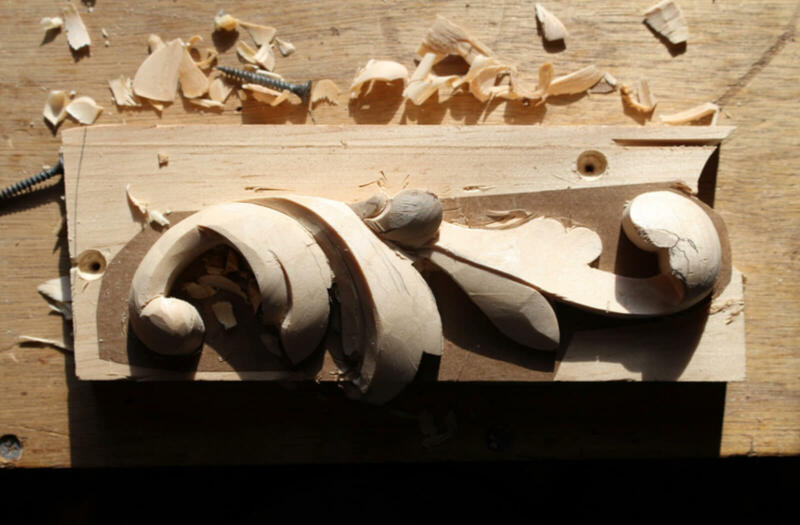 Most of the work in a carving is getting to the point where you can put in those last cuts that really make or break the appearance of the job. 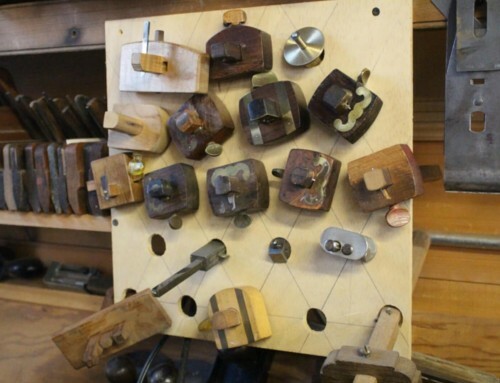 Before then, the work is in making decisions about sizes, shapes, locations, and which tool to use. Here an element that will be glued onto an ornate frame is being carved on a separate backboard, stuck on with hide glue and paper. This carving is about 7” long. The rough shapes and heights are being decided upon. The flipped leaf end at the right has been roughed in with a big no. 7 gouge, while the heights and basic curves of the other parts have been done with a 5-35. Now the leaves have been roughly divided and the 5-35 is being used to round the top of the big ones because it is the exact curve of the leaf tops. 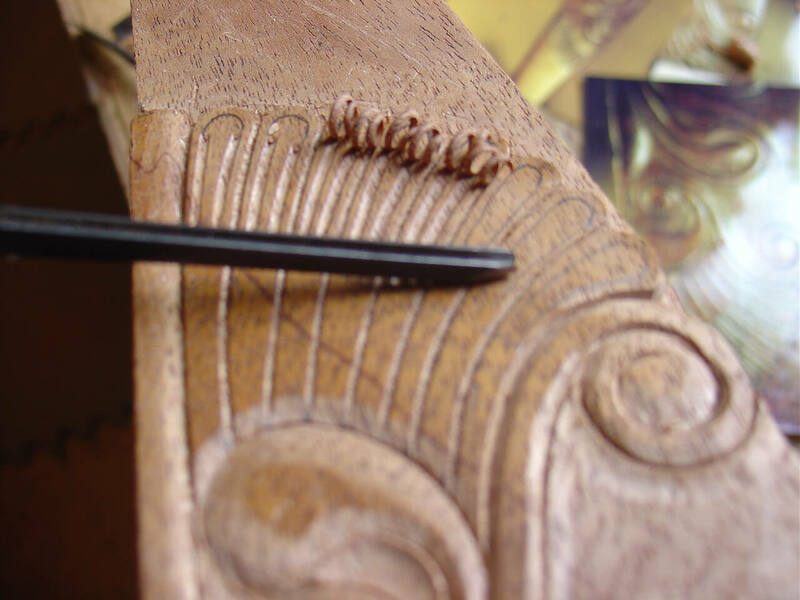 Tool selection is critical- a big tool with the proper sweep will leave no marks because it’s used to shape the whole surface of the element being carved. Note how smooth the surface is where the curl is still attached to the leaf. 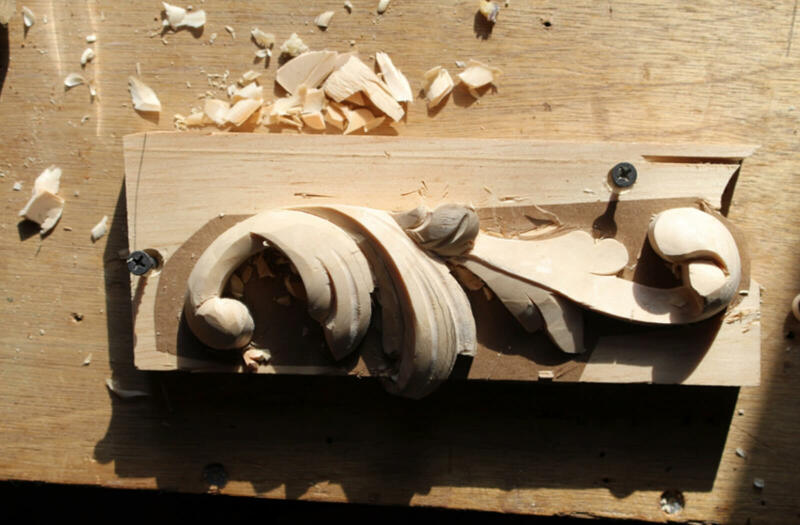 A smaller tool would need two passes to make the leaf, leaving facets. 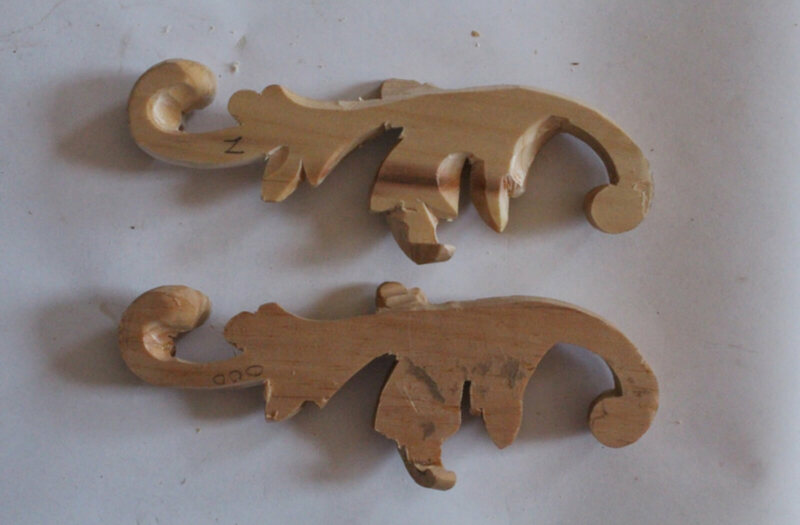 We are not trying to make this “look hand carved”, we are trying to make it perfect. At this point the major surfaces have been shaped with tools of the appropriate curve for the surfaces. Note that there are very few facets. The idea is to have one curved surface seamlessly blend into the next, the meeting point of the two cuts being invisible. Some of the veining cuts have been put in here. These will lead the eye around the surfaces, accentuating the curves. Above is a finished piece with all its veins and leaf cuts in place leading the eye around the curves and creating more flow. Making these cuts flow smoothly without any hesitations or flat spots is critical to the success of the look. 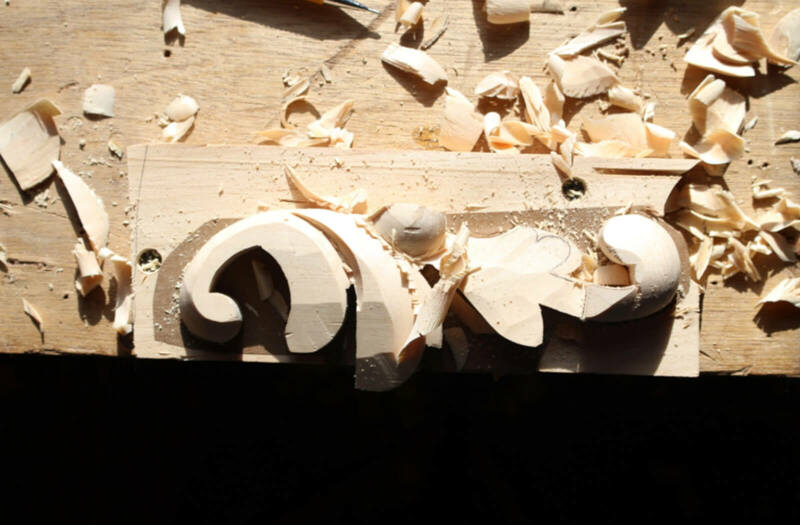 Usually I wait until all the carvings are done, then go back and put all those critical final cuts in at once. In this way you can practice and repeat the motions needed to get the consistency and smoothness that are needed for a good look. 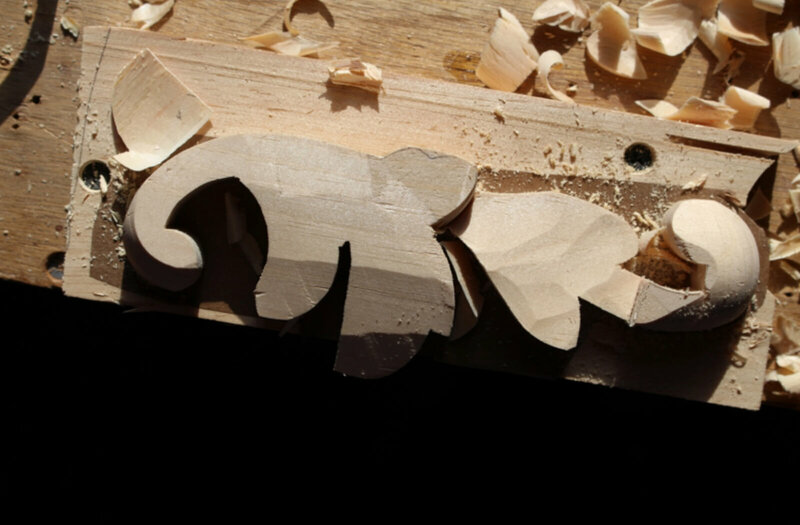 The back of a light carving like this has to be “backed out” or thinned down, so that it will look light and airy from the front. This is done with a knife or a small gouge. I’ve broken quite a few in the process. 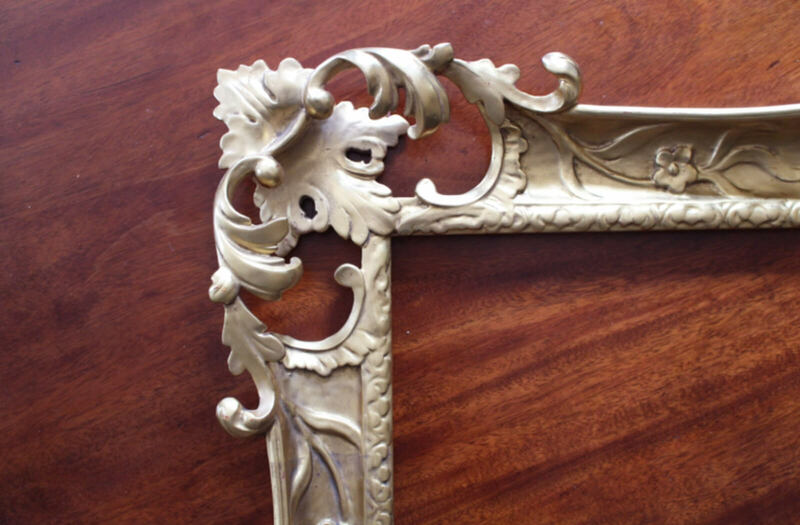 Photo color is not correct, but this is the corner of the frame after the carvings have been attached, gessoed and gilded. 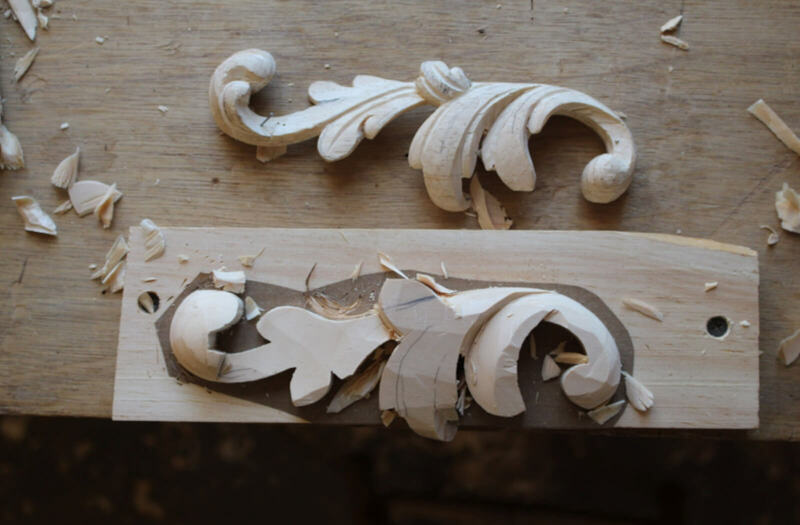 The carving below was done before the separate elements were glued on. 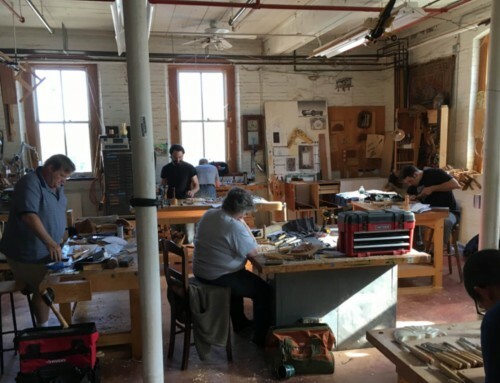 This class will cover the hallmark Newport elements: concave and convex shells, ball and claw and bracket feet and the Egyptian-like sparse knee carving.